Now issued as a Routledge Education Classic Edition, Bud Goodall’s Writing Qualitative Inquiry responds to the rapid growth of personal narrative as a method of inquiry among qualitative scholars by offering a concise volume of practical advice for scholars and students seeking to work in this tradition. He provides writing tips and strategies from a well-published, successful author of creative nonfiction and concrete guidance on finding appropriate outlets for your work. For readers, he offers a set of criteria to assess the quality of creative nonfiction writing. Goodall suggests paths to success within the academy—still rife with political sinkholes for the narrative ethnographer—and ways of building a career as a public scholar. 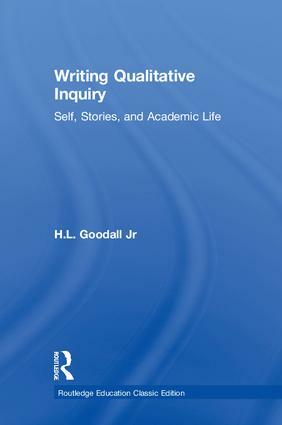 Goodall’s work serves as both a writing manual and career guide for those in qualitative inquiry. A new foreword by Christopher N. Poulos reflects on Bud Goodall’s life and work, and the impact of this book on narrative writing. H. L. (Bud) Goodall, Jr. was Professor of Communication and Director of the Hugh Downs School of Human Communication at Arizona State University until his death in 2012. He was the author or co-author of 20 books, including A Need to Know: The Clandestine History of a CIA Family (Left Coast Press, 2006), which won the "Best Book of 2007" award from the Ethnography Division of the National Communication Association, as well as over 150 articles, chapters, and papers. Christopher N. Poulos is Professor and Head of the Department of Communication Studies at the University of North Carolina at Greensboro.